FEAR OF THE FOREST is London’s premier (and possibly only) dulcimer-led ensemble. 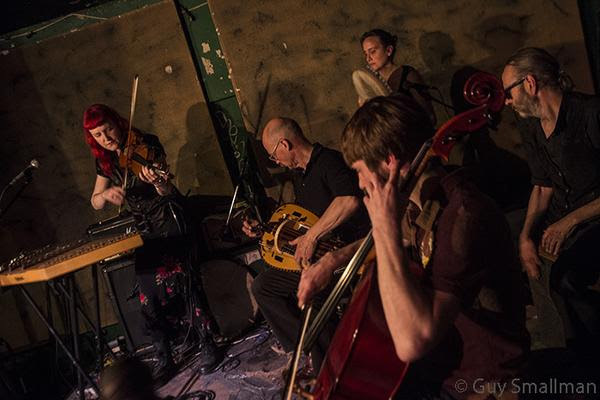 Formed in 2012 and fronted by Kate Arnold on hammered dulcimer, violin and vocals, the band combines influences from English and French folk, Middle Eastern and even classical music to create a sound that has been described as ‘punk baroque’. Minor keys, medieval harmonies and irregular yet insistent rhythms are defining features, and the underlying energy of the percussion is offset by the hypnotic, mysterious qualities of the dulcimer and vocal textures that range from the raw to the ethereal. Lyrically the songs draw upon folk and fairy tales, Middle Eastern mythology, family and social history, political affairs, and the strange tales of Kate’s half-gypsy grandmother; all treated with a dry and sinister humour. Kate has recently worked with Lisa Knapp, Doudou Cissoko and Daemonia Nymphe, and was previously a member of Sergeant Buzfuz, Paul Hawkins and the Awkward Silences, and Seventh Harmonic. She has an MMus in Ethnomusicology from the University of London’s School of Oriental and African Studies, but this does not stop her breaking the rules of traditional music whenever possible! Chris Silvey (the No Frills band) on cajon, further percussion, and occasional distant trumpets.